Despite intermittent affliction with zombie-ism, Uncle Alayna cheerfully and toe-tappingly present crooning swing tunes and traditional standards from heroes past and present; hot musettes from the dance halls of France; and many sweet originals. 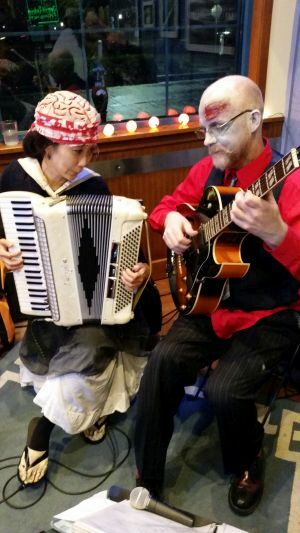 Uncle Alayna features Rich Sikorski on guitar and vocals, and Maggie Kim on accordion. They both can often be seen playing with Olympia band “Chickadee,” as well as the group “Bric-a-brac” in Seattle. To see Uncle Alayna, be sure to come early as their contribution will precede the stage show’s starting time.